After three gruelling days of poker and a five-hour final table, Event 20 - $1,500 Pot Limit Holdem has come to an end with John-Paul Kelly victorious! The field contained 633 of the toughest players from around the world including John Juanda, Andy Bloch, Allen Cunningham, Brandan Cantu, Jason Mercier and JC Tran. However when the final table came back today there would be only one big name remaining, with the crowd favorite Erik Seidel in great shape to capture his ninth bracelet and fifty-fifth WSOP cash. However Seidel would fall in seventh as UK's own John-Paul Kelly started marching up the chip counts page following some luck, a rush of cards and a great application of patience and skill. Entering heads-up play with the chip advantage against Germany's Marc Tschirch, Kelly and Tschirch would see-saw back and forth eventually falling back into even contention. However it would be UK that would take down this European battle when Kelly outdraw Tschirch on the turn to capture the $194,434 first prize, title of champion and coveted gold bracelet. 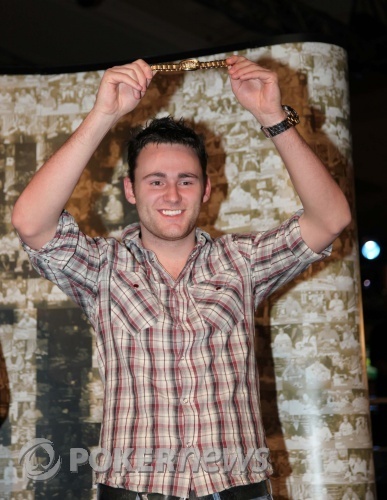 Congratulations to John-Paul Kelly for capturing the Event 20 Gold Bracelet. Make sure to stay tuned to PokerNews for the remainder of what is to be a very exciting 2009 World Series of Poker! Marc Tschirch Eliminated in 2nd Place ($120,102); John-Paul Kelly Wins! Marc Tschirch raised to 55,000 from the button and John Paul Kelly reraised to 150,000. Tschirch called. The flop came . Kelly led out for 155,000 and Tschirch called. The fell on the turn and Kelly continued to fire bullets, betting 300,000. Tschirch moved all in and was called instantly by Kelly. Tschirch needed a five to stay alive, but the rail was full of Kelly supporters, including Neil Channing, chanting "Deuuucce"
The hit on the river crowning a champion - John Paul Kelly. Tschirch finishes in 2nd place, earning $120,102. With play now back to even, the rail is starting to get a little stronger. Roland De Wolfe has stumbled in to chat to Neil Channing and a few other UK-based players, while Chris Moorman has also taken up a seat to watch over the action. 5th place finisher Aaron Virchis is also watching on, possibly contemplating what could have been. John-Paul Kelly limped the button, only to be faced with a 72,000-chip raise from Marc Tschirch. Kelly called and checked behind on the flop of . When the turn landed the Tschirch lead out for 96,000 with Kelly making the call. The river fell the and a 200,000-chip bet was called by Kelly to see Tschirch table his to take the pot down. Marc Tschirch raised to 55,000 and John-Paul Kelly called. 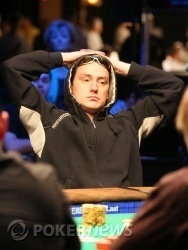 The flop came and Kelly checked action over to Tschirch who bet a pot sized 110,000 to take it down. Marc Tschirch opened on the button to 52,000 and John-Paul Kelly made the call. Kelly check-called 77,000 on the flop and when the turn brought the both players checked. The river also followed suit when the was checked by both players to see Kelly roll over his for two-pair. 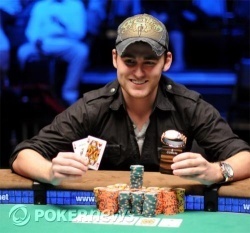 Tschirch mucked his hand as Kelly was pushed the pot to climb back to 1.8 million in chips. Marc Tschirch raised to 60,000 from the button and John Paul Kelly called. The flop came and Kelly checked. Tschirch bet 65,000 and Kelly check-raised to 175,000. Tschirch laid down his hand and Kelly raked in the chips. John-Paul Kelly made it 60,000 to go from the button and Marc Tschirch defended his big blind. When the flop fell down Tschirch was faced with a 75,000-chip bet from Kelly; which he called. However when the landed on the turn, Tschirch took the lead pushing out 95,000 to prompt a fold from Kelly. John-Paul Kelly limped in and Marc Tschirch checked his option. The flop fell down and Tschirch lead out for 26,000 to prompt a fold from Kelly. Marc Tschirch raised from the button and John Paul Kelly called. The flop came . Kelly cheked, Tschirch bet 65,000 and took down the pot.